This device provides extremely accurate and fast inspection and counting of SMD components, which can save you a lot of time in inventory counting. Each counting cycle is completed in just 40 seconds, with an accuracy rate as high as 99%. When the counting process is finished, the machine will automatically produce barcode labels and the list of components counted can be exported to Excel. 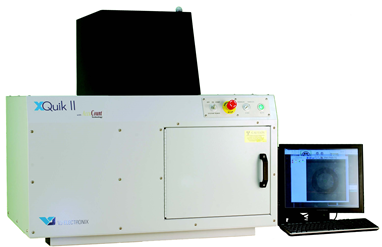 Featuring an intuitive programme tool, the device is also able to check for and identify any errors in the intermediate layers of multi-layer printed circuit boards to ensure a higher level of precision and reduce the number of rejects, which in turn leads to a better quality of final products. In addition to the above, the XQuik device can also run a compliance scan on solder contacts or solder joints. We provide machine renting services, which means that your components are counted at our premises. Since this is a small and user-friendly device, it can also be easily transported to your location.